Last Friday, state Rep. Greg Markkanen joined me in Bessemer for an evening townhall meeting with area residents to talk about important issues affecting them and our state. 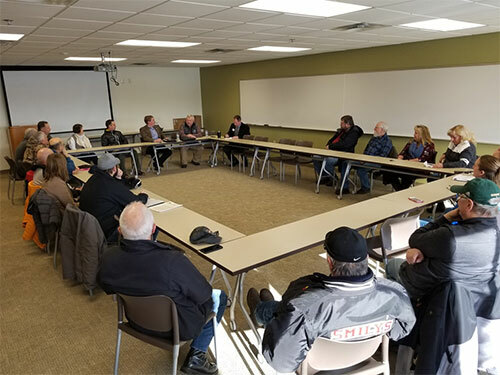 It was a great opportunity for us to meet with Gogebic area families to have an in-depth discussion, including the many new challenges some are facing after the closure of the Ojibway Correctional Facility last year. It was also great to talk about the economy, auto insurance, mental health and public service needs, property access concerns, and any other state issues on Yoopers’ minds. The townhall capped a day full of meetings for me in Gogebic County with elected officials, business owners, local leaders and other members of the community. I look forward to holding more townhalls throughout the 38th District soon. Legislation that I recently introduced would overturn a 2012 law that eliminated the 95-A District Court Judgeship in Menominee County. Over the past 8 years, felony filings in the Menominee District Court have increased 67 percent, and Dickinson County has seen a 46 percent increase since the 2012 law. With substance abuse problems on the rise, and with only 11 judges available now to handle nearly half of all U.P. cases, eliminating one would only worsen the imbalance that already exists. We must take action immediately to preserve this judicial resource and the due process rights of U.P. residents. Senate Bill 87 would reverse the 2012 action that eliminated the 95-A District Court Judgeship, which is set to take effect on March 31, 2019. The 2012 law eliminating the position was based on a State Court Administrator’s Office (SCAO) Judicial Resources Recommendation (JRR) calling for the removal based on data and statistical analysis from 2008-2010. Statistics now show the situation has changed drastically. SB 87 was referred to the Senate Judiciary Committee for consideration this week. On Feb. 4, Gov. 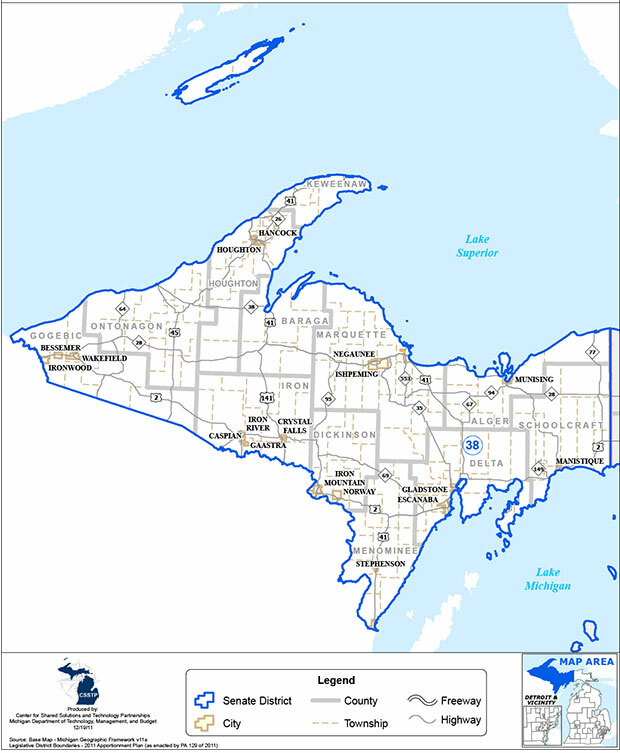 Gretchen Whitmer signed Executive Order 2019-2 restructuring the Department of Environmental Quality as the Department of Environment, Great Lakes, and Energy (EGLE). The executive order also creates new offices within the department, including the Office of the Clean Water Public Advocate, the Office of the Environmental Justice Public Advocate, and the Interagency Environmental Justice Response Team while abolishing oversight boards created by the Legislature last year to ensure citizens could have their concerns heard on permit and regulatory issues. The Senate Oversight Committee which I chair is currently taking testimony on this Executive Order and House Concurrent Resolution 1 which would disapprove the Governor’s Executive Order. I am eager to hear what U.P. residents have to say. Please contact my office with your thoughts or concerns on this move by the governor. You can reach me by phone toll-free at 866-305-2038, via email at SenEMcBroom@senate.michigan.gov, and by U.S. mail at Sen. Ed McBroom, P.O. Box 30036, Lansing, MI 48909. Whatever the season, fishing is a fantastic way to spend time in Michigan’s great outdoors! 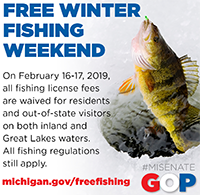 Michigan’s annual Winter Free Fishing Weekend — held Feb. 16 and 17 this year — offers an opportunity to enjoy cold weather fishing. Favorite winter species include yellow perch, bluegill, pike, smelt and walleye. All fishing license fees are waived for the two days. All fishing regulations still apply. Parking is also free at state parks and recreation areas during the free fishing weekend. 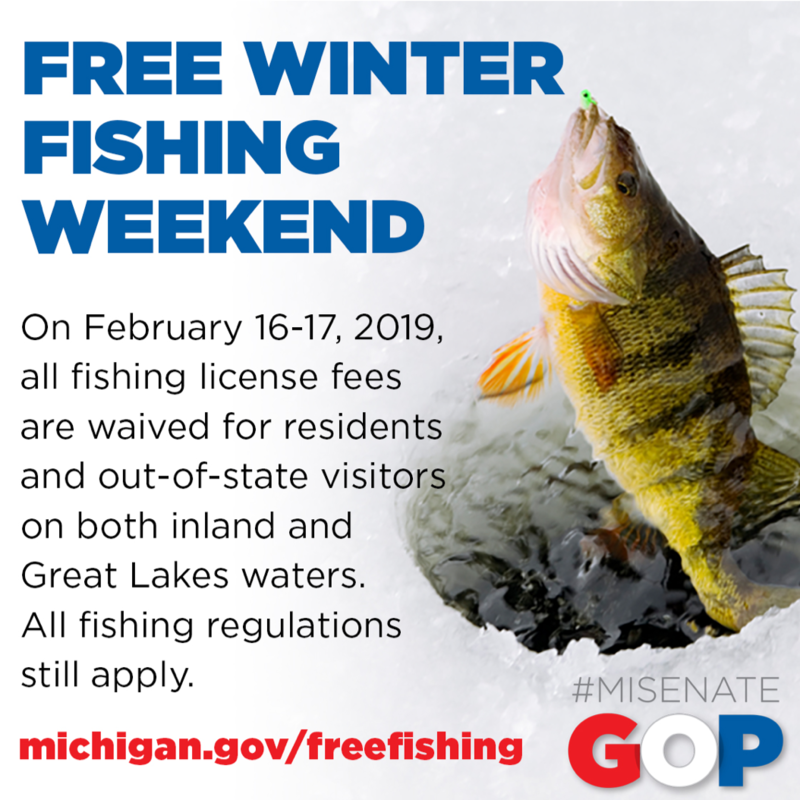 Find more details, including information on sponsored events, at www.michigan.gov/freefishing. 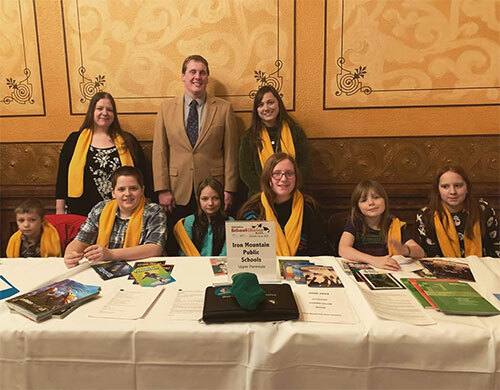 It was great to have these visitors from the Iron Mountain Partnership visit the Capitol recently. I always look forward to the opportunity to visit with folks from back home when they come visit the Capitol, and even more so when it is school children. Please reach out to my office if you are planning a trip to Lansing and we’ll be happy to welcome you in my office and show you around the Capitol.